This week we were invited to a friends house for some drinks and food, they had some family visiting with them and there was a birthday to celebrate during their stay. 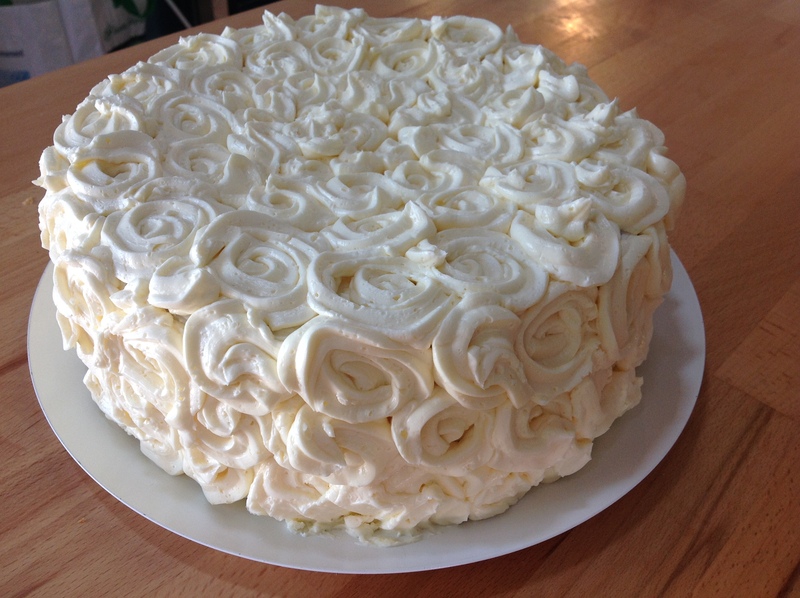 I had offered to make a cake for the celebration, and it was to be simple, but something to help them all celebrate, a victoria sponge or chocolate cake, with chocolate or icing….. This icing was a revelation, I had been looking for something more than a chocolate icing or butter icing, so I went in search for ‘that something special’ and I found this, an Italian meringue butter-cream. I have made italian meringue on various occasions, for topping tarts and cakes, but then I would use the small brulee torch and we would have a toasted marshmallow topping, so it was a good start. The recipe I have for italian meringue uses equal quantities of sugar and water to create the syrup that cooks the egg whites, but this recipe has the addition of golden syrup. I started off with the sugar in a medium/small pot and added the equal quantities of water and golden syrup, and placed on a low/medium heat, until all the sugar had melted. Once the sugar had melted I turned up the heat a little to bring the mixture to the boil and allowed it to boil until it reached 115C, this took about 10 minutes. In the large bowl of my stand mixer, I added the egg whites and a pinch of salt and cream of tartar, research has explained that the cream of tartar allows the egg whites to ‘stretch’ more. I started to mix the egg whites on a medium speed, continuing to mix them until they were coming to peaks. All the time, keeping an eye on the sugar mixture, I needed it to reach 121C, once it had reached the magic 121C, I removed it from the heat, and started adding it in a slow stream to the egg whites, this cooks the egg whites while producing a wonderful glossy meringue. I kept the stand mixer going, probably for about 15 minutes, until the bowl cooled down, well was cold in fact. At this stage it was time to start adding the chopped butter, this I did slowly and gradually, about 1 tablespoon at a time, squashing each of the cubes between my finger tips, just before I added them to the mixture. I allowed the butter to be incorporated before I added the next tablespoon, just making sure I had a lovely even, glossy Italian meringue butter-cream. Most of the recipes I looked at, hinted that the mixture would likely curdle, but not to worry, but to just work through it to you had a soft glossy butter cream. I have to be honest, I was concerned, but I didn’t need to worry, as it all came together and it didn’t curdle. Once it was ready, I gave the mixture a quick beat with a wooden spoon, just smooth out some of the bubbles and left it on the side with a lid on it until I was ready to use it. 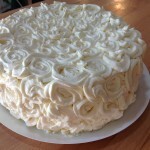 I had to wait for the 2 layers of victoria sponge to cool down as I didn’t want the butter cream to slide off the cake …. ha ha. You can flavour and colour this mixture, I didn’t this time, but I will definitely be trying it the next time. It was very stable and good to work with, I did place the cake in the fridge until I needed to box it up to take to the party and it really helped with the transporting. We did leave it in the fridge until about 15 minutes before we were going to cut it as the weather was fantastic, and I knew the butter cream would have melted. All in all it was a great recipe and a great day. Rich, glossy, creamy, Italian meringue butter-cream, a fantastic way to cover a cake for afternoon tea or a special celebration. Place the caster sugar, golden syrup and water into a medium pot and place on a low heat until the sugar has melted. Turn up the heat and bring the mixture to a rolling boil, not too hard. Continue boiling the sugar mixture until it reaches 115C. Continue heating until it reaches 121C. Place the egg whites, a pinch of salt and the cream of tartar into the large bowl of a stand mixer and mix until you have a meringue mixture. 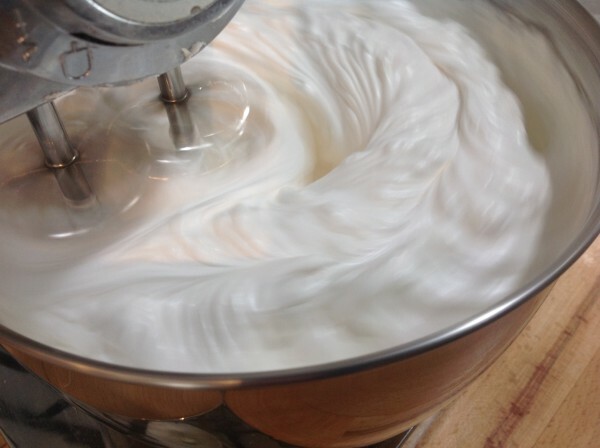 Once the syrup has reached 121C, remove from the heat, and slowly pour it down the side of the stand mixer, onto the egg white meringue, make sure not to allow the syrup to touch the whisks or it will hit the side of the bowl and not be incorporated. When you have added all of the syrup, continue mixing the meringue until the side of the bowl is completely cold, about 20 minutes. Chop the butter up into small cubes, ready to add to the meringue mixture. Once the meringue is cold, start adding the chopped butter, about 1 tablespoon at a time. Press the butter between you finger tips just as you are adding it, to help with it incorporating into the meringue. Continue until you have added all of the butter and you have a nice smooth Italian meringue butter-cream. 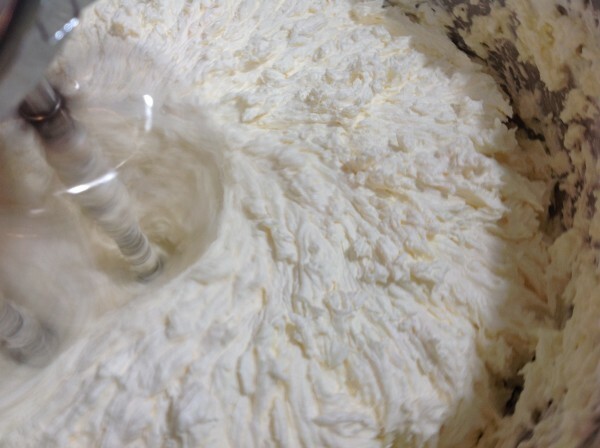 Beat the mixture with a wooden spoon, to remove any bubbles that may be there with the machine whisking. Place a lid on top of the bowl until you are ready to use the butter cream. If you need to refrigerate it until you need it, remove it from the fridge about 1 hour before you need to use it and give a good whip again just to make sure it is soft enough to pipe. You can add flavours and colours to the mixture, add the flavour before you add the butter and add the colour while you are adding the butter, as it is less likely to break down the meringue at this stage. If you mixture curdles during the addition of the butter, just keep mixing, it will come back together again into a soft smooth, butter-cream.